Developing effective ESL euphemism lessons is one of the most beneficial ways teachers can help English language learners. Using euphemisms involves using a word or phrase that is more socially acceptable in place of another word or phrase perceived as inappropriate in certain contexts. Factoring in the great amount of genre specific language in English (legalese, doublespeak, political speak, etc.) failing to understand euphemisms leaves students vulnerable to manipulation and exploitation by language. While native speakers understand the nuances of English, ESL students often struggle to internalize the social codes of conduct that fuel the need for euphemisms; therefore, they find it very challenging to use them effectively. This is particularly problematic because the English language fluency requires users to master this skill. In addition, through the rise of political correctness, the English language is becoming more and more euphemistically complicated every day. When someone dies, it is often said that they "passed on" or "passed away." In this way, a phrase is created that evokes a softer, gentler image that avoids confronting harsher realities. Continue by writing some commonly euphemized words on the board and see if the class can provide a list of effective examples. Fat = overweight, full-figured, big boned, chubby, plump, voluptuous, portly, etc. Poor = working class, of modest means, of humble origins, low-income, unable to make ends meet, in debt, etc. Handicapped = disabled, differently abled, physically challenged, disadvantaged, etc. Remedial = developmental, special needs, etc. Homeless = without a roof over one's head, on the streets, destitute, dispossessed, displaced, etc. Continue this brainstorming activity before going on to the next set of euphemisms. Garbage collector = waste disposal worker, sanitation worker, waste management, etc. 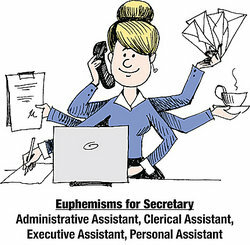 Secretary = administrative assistant, clerical assistant, executive assistant, personal assistant, etc. Janitor = custodian, caretaker, superintendent, maintenance worker, etc. Boss = supervisor, executive, director, manager, etc. School = institute, academy, university, conservatory, etc. They have now seen concrete examples of how certain language softens the impact of words and how to manipulate language to inflate or mislead. Students can now take sentences filled with euphemisms and translate them into simple, direct language. The executive administrator accused the caretaker of contributing to the misappropriation of office supplies. The clerical assistant had an inappropriate relationship with the office building's superintendent. Jenny's dog Bowser went to the great doggy park in the sky. The executive in charge of increasing the company's workforce requested proof that the applicant had never been detained for possessing controlled substances. After the groups create their sentences, have them share their findings with the class. The more creative the teacher is when creating the example sentences, the more fun the exercise can become. As with all issues involving second language learning, leading students through ESL euphemism lessons in the classroom can provide necessary awareness and introduce critical skills, but they are not enough on their own. ESL students, even more so than native speakers, need to read, write, and speak in English at every available opportunity. There is no magic button to second language acquisition; but effective lessons, combined with English immersion, can ultimately lead students to English language fluency. "Euphemism Lessons." YourDictionary, n.d. Web. 22 April 2019. <https://esl.yourdictionary.com/lesson-plans/euphemism-lessons.html>. Developing effective ESL euphemism lessons is one of the most beneficial ways teachers can help English language learners. Using euphemisms involves using a word or phrase that is more socially acceptable in place of another word or phrase perceived as inappropriate in certain contexts.Speakers use euphemisms to:Avoid using words that have a negative stigma attached to themAvoid offending others by speaking of taboo or sacred subjects directlyOver-inflate the importance of certain wordsObfuscate meaning from othersFactoring in the great amount of genre specific language in English (legalese, doublespeak, political speak, etc.) failing to understand euphemisms leaves students vulnerable to manipulation and exploitation by language.